29-year-old Matt Campbell was running his second marathon in as many weeks. Matt Campbell was running his second marathon in as many weeks. A CHEF WHO reached the semi-finals of Masterchef: The Professionals last December has died after he collapsed during yesterday’s London marathon. Matt Campbell was running his second marathon in two weeks and was racing in memory of his father who died 18 months ago. He was also raising funds for a charity which helps vulnerable children and had finished the Greater Manchester marathon on 8 April. Yesterday’s race was the hottest London marathon on record with more than 40,000 runners taking part as temperatures reached over 24C. Participants were warned that it could feel even hotter on the roads because of the presence of other runners and the heat absorbed by the course itself. The 29-year-old collapsed at the 22 mile mark before he died later in hospital. Email “Masterchef semi-finalist dies while running the London marathon in memory of his dad ”. 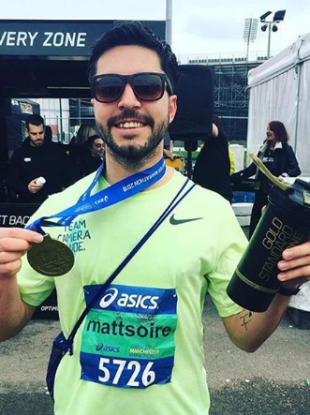 Feedback on “Masterchef semi-finalist dies while running the London marathon in memory of his dad ”.